Below are some additional pictures from the recent gear recovery that occurred. For more information and pictures, please visit our Facebook page. The OFCC recently updated OFCC cable route data layers for marine navigation software programs used by the west coast trawl fishing fleet. OFCC Cable Route Version 10 is available on USB Flash Drives for Maptech Offshore Navigator©, Coastal Explorer©, P-Sea WindPlot II©, ECC- Globe©, Nobeltec©, Simrad-Olex©, and BndryWP. The updates include the new NCP and Hawaiki cable routes off Pacific City. These files are available on USB Flash Drives or by e-mail free of charge to US West Coast Trawlers. Contact the OFCC office at (503) 325-2285 or staff@ofcc.com to receive a copy. The OFCC and Google began working on a route for the FASTER cable in July 2014. As part of this process, Google and OFCC reps worked with fishermen on their trawlers in Charleston to design the route to maximize burial in the fishing grounds by using the local knowledge of the trawl fleet. This was highly effective, as the route resulted in good burial through the trawl fishing grounds out to over 800 fms. Google continues to work closely with and has good relations with the OFCC. With construction and end-to-end testing complete, a new trans-Pacific submarine cable system, the “FASTER Cable System,” started service on June 30, 2016. Construction of the system was announced in August 2014. The 9,000km trans-Pacific cable lands in Oregon near Bandon and has two landing points in Japan. On the West Coast of the U.S., the system has extended connections to Los Angeles, the San Francisco area, Portland and Seattle. In Asia, FASTER has connectivity to many neighboring cable systems, extending its capacity beyond Japan to other Asian locations. This six-fiber pair cable has an initial design capacity of 60 Terabits per second (Tbps) of bandwidth across the Pacific. Because of this push for more speed, “FASTER” became the project name. FASTER is a consortium of six international companies: China Mobile International, China Telecom Global, Global Transit, Google, KDDI and Singtel. Google is the U.S. Landing Party. NEC Corporation built and was responsible for this cable. Google joined the OFCC in November, 2014. The NCP cable, slated to be ready for service at the end of 2017, will span more than 13,000 km and extend from Pacific City to Japan, Korea, two points in China, and Taiwan. It is a new generation high capacity fiber-optic submarine cable system with a capacity up to 80 Terabits per second (Tbps). Microsoft is the U.S. landing party and a partner for the NCP Consortium that includes Chunghwa Telecom, KT Corporation, China Telecom, China Mobile, and China Unicom. TE SubCom is the supplier, providing the infrastructure necessary. Microsoft joined the OFCC in March 2016. Cable installation activities are expected to begin off the Oregon coast in April, 2017. Hawaiki Submarine Cable USA LLC joined the OFCC on October 14th, 2016, becoming the eighth submarine cable owner, joining General Communications, Inc. (GCI), Alaska Communications (ACS), Verizon, Tata Communications, The Consortium for Ocean Leadership, GU Holdings Inc. (Google), and Microsoft Infrastructure Group, LLC. 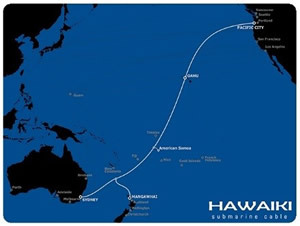 The Hawaiki submarine cable will land in Pacific City, Oregon and cross the Pacific Ocean to Oahu, Hawaii, New Zealand and Australia. The cable has a design capacity of 42 Tbps, and is expected to be ready for service in June of 2018. The installation activities off Oregon will take place in late summer of 2017. The Oregon fishing industry collaborated on the route on the Oregon shelf and slope. On December 20th, 2010, the Consortium for Ocean Leadership entered into an agreement with the Oregon Fishermen's Cable Committee, Inc. (OFCC) becoming the fifth cable owning member of the OFCC. The agreement covers the two undersea fiber optic cables that will be laid off the Oregon coast near Pacific City, OR. These undersea cables will be part of the Ocean Observatories Initiative (OOI) Regional Scale Nodes (RSN). 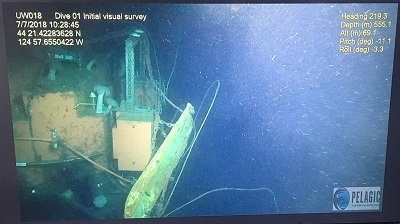 One of those cables terminates near the Axial Seamount about 250 nm off Tillamook Head where sensors will monitor conditions near the undersea volcano. The second cable will have segments that approach the coast from the deep ocean abyss near Newport, OR. The agreement addresses such issues as cable installation and burial, inspection, participation in the OFCC Sacrificed Gear Fund, a hot line number for fishermen to call to report possible gear conflicts and the other topics found in the usual OFCC cable agreements. As with other OFCC cables, fishermen will be able to fish over the buried cable and be asked to avoid towing over any exposed cable. These cables are unique in that at four locations on one cable there are scientific "nodes" that will have sensors and instruments attached. These areas were selected in cooperation with representatives from the fishing fleet in Newport in order to minimize the loss of high value fishing grounds. The sensors and instruments will be located in no fishing "safety zones" for their protection. 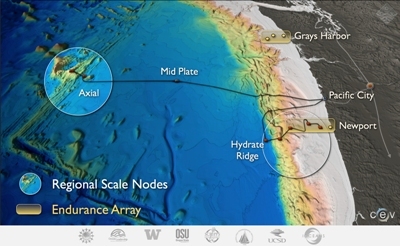 The OOI RSN will extend continuous high-bandwidth (tens of Gigabits/second) and power (tens of kilowatts) to a network of instruments widely distributed across, above and below the seafloor in the northeast Pacific Ocean. As the world's first ocean observatory to span a tectonic plate, this facility will provide a constant stream of data in real time from the ocean, on the seafloor, and below the seafloor within the Juan de Fuca plate. This scientific data will be available, via the internet, to the general public. The OOI is funded by the National Science Foundation; for more information see www.oceanobservatories.org. 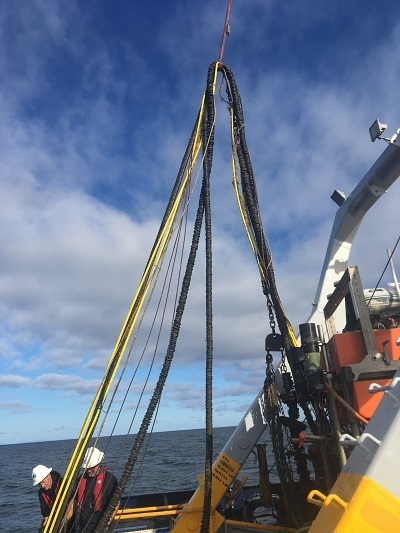 The OOI has been developed to provide the U.S. ocean sciences research community with access to the basic infrastructure required to make sustained, long-term measurements in the oceans. The research cable will be installed in phases, with primary cable backbone being installed in the summer of 2011, the nodes being installed in the summer of 2012 and the secondary cables, research instruments and sensors being installed in 2013 and 2014. FISHERMEN! 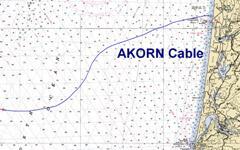 UPDATE YOUR NAVIGATIONAL SOFTWARE TO INCLUDE THE NEW AKORN CABLE POSITIONS. 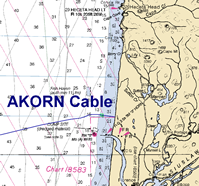 As a result of this project and other recent cable inspections, Oregon Fishermen's Cable Committee has updated its navigational software programs. Included in the Version 6.5 update are the coordinates of the AKORN Cable and the one known cable exposure on AKORN described above. In addition, this version includes the coordinates of the other cables and all known exposures. Please ensure that you have this update loaded on your vessel's plotter. The OFCC currently has updates available for Nobeltec Visual Navigation Suite and ECC-GLOBE. Maptech Offshore Navigator and P-Sea WindPlot updates will be made available shortly. The Oregon Fishermen's Cable Committee (OFCC) recently initiated a marine debris cleanup project aimed at removing lost crab pots and trawl nets from Oregon's ocean waters. The project is a partnership between the OFCC, the Oregon Dungeness Crab and Salmon Commissions, the Oregon Dept. of Fish and Wildlife, and the Oregon State Police, Oregon's commercial fishing and crabbing industries, Tyco Telecommunications, and Oregon Sea Grant. It is being supported by a $50,000 grant from the National Oceanic and Atmospheric Administration, a significant corporate donation from Tyco Telecommunications as well as donated services from the other partners, for a total project budget of $170,000. The derelict crab pot removal phase of the project was completed in September and October 2006. The project successfully recovered derelict crab pots from a site on the Northern Oregon Coast and a site on Southern Oregon coast. This project resulted in approximately 1200 acres being swept and cleaned of marine debris. The second phase of the project focused on grappling for and removing sacrificed trawl gear from the seafloor. The fishing gear was required to be abandoned to protect telecommunications cables. After inspection of the sites determined that the fishing gear was not hooked on the cable, the nets were slated for removal. Over the course of three days at sea the F/V Seeker successfully recovered three sets of complete gear as well as one partial set of gear. Both phases of this project not only improve the quality of the ocean seafloor and its habitat but also return valuable fishing grounds to productive use. Collection of this gear minimizes potential gear hangs by reducing the number of seafloor obstructions. The committee is made up of representatives from the fishing industry, cable company executives, and a telecommunication specialist. Here is the list of trawl vessels that have signed up for membership in the OFCC. General Communication Inc. (GCI) signed an agreement with the Oregon Fishermen’s Cable Committee on January 17, 2003. The agreement covers a proposed new cable to be known as Alaska United West. The cable will land on Clatsop beach near the town of Warrenton, OR. and in Seward, AK. The cable will be buried through the fishing grounds off Oregon. The agreement is almost identical to the one signed by Tyco Telecommunications for the Tyco Global Network Pacific cable system which has three Oregon landings in Tillamook County, OR. GCI is the largest telecommunications provider in Alaska. The company provides local, wireless, and long distance telephone service, cable television, Internet and data communication. More information about the company can be found at www.gci.com. With the successful installation of Tyco Global Network (TGN) Pacific Ring Segment 6 cable off the Oregon coast in August of 2002, the TGN network is now complete. The cable system has three landings in Oregon. Two of the cables carry telecommunications traffic to Japan; one connects to the Los Angeles area of California. The cables are among the highest capacity cables in the world with the ability, when fully equipped, to convey over 5 terabits of data per second on each cable. 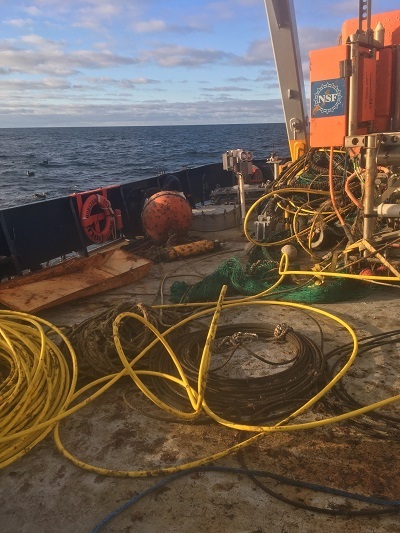 Tyco installed their own cable and achieved 100% burial in the fishing grounds on Seg. 6. 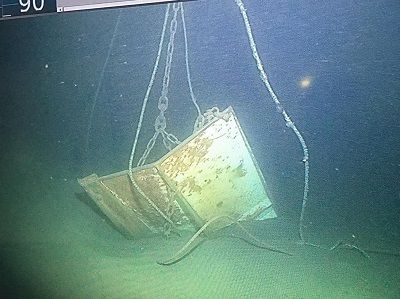 Fisherman Jim Seavers, who was aboard the installation vessel, had high praise for the installation: “Tyco went out of their way to make sure the survey was done well enough to insure we would have a route that would insure good burial, and that is what they accomplished”. The Tyco cable system was purchased by Tata Communications and is now known as Tata Global Network (TGN).